According to the Entertainment Software Association’s (ESA) 2015 Essential Facts report, more people are purchasing digital games than physical games. A newly released chart looking at data compiled from 2014 shows that 52 percent of games are sold via digital formats, while 48 percent are sold via physical formats. 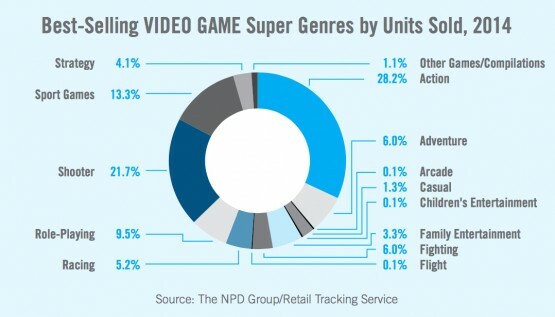 Of course, the data takes into account mobile games, DLC content, digital subscriptions, and full digital games, while physical games are generally only big name titles, so take that as you will. The ESA also compiled some data which shows the popularity of each video game genre in comparison to each other. Not surprisingly, action games are easily the most popular, with shooters trailing behind them. Strategy games and racing games were pitifully some of the least popular game genres of 2014. Take a look at the above two charts and let us know what you think. Do you buy more digital games than physical games? What is your favorite game genre?